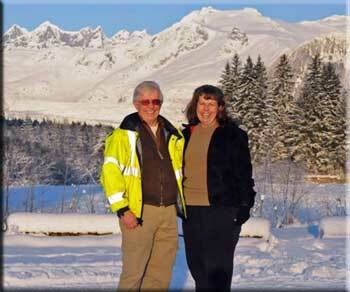 We started T. W. Hall in 1980 as a part-time operation designed to fill the plowing needs of the Greater Juneau community. Our first plow was an 8' blade mounted onto a 1976 Ford F250 4x4. It lasted for 15 years. In the spring of 1982, Dwan quit working for the University of Alaska to become a full-time, self-employed contractor. This was when we purchased our first dump truck. That fall, we also purchased a big model 975 Bobcat to help clear, stack and remove snow for our contracts. We're proud to report that in just under 30 years of operation we grown from a company with a simple one-truck plow that cost $4000 to an operation with assets worth over $1 million today. Our mission, as always, is to help keep the great city of Juneau looking at its best throughout all seasons of the year. We have learned for a fact that one small company can make an impact on the quality of the surroundings in the city in which it is located. Our thanks for this go out to the great people of Juneau. It is only through their support that our success and growth have been possible. The achievements of T.W. Hall, despite being located in the relatively small Juneau marketplace, have even been recognized by the editorial staff of WorldSweeper.com, the power sweeping industry's largest professional resource. In January of 2009, T.W. Hall was chosen as Contractor of the Month by WorldSweeper.com, one of only 12 contractors in the United States to receive that honor for 2009. We are also proud to be a Founding Member of the WorldSweeper.com Ethics in Power Sweeping Program, which confirms that we operate our company to the highest sweeping industry standards. If you think we might be of service to your organization, please give us a call or send us an email. We'll be glad to provide you with a free consultation on the professional services we offer.